If installing a new rear differential carrier assembly, remove the 2 differential side seal caps before installing the rear drive shaft assembly. 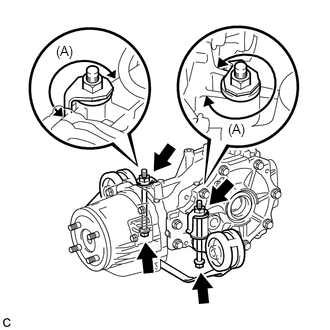 This step should be performed only when the rear differential dynamic damper is replaced. 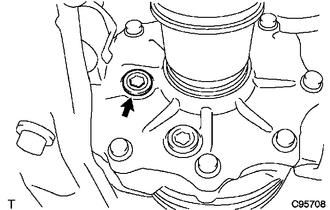 (a) Install the rear differential dynamic damper with the bolt. (a) Temporarily install the rear No. 1 differential support to the differential carrier assembly with 2 new bolts and 2 new nuts. Be sure to install the rear No. 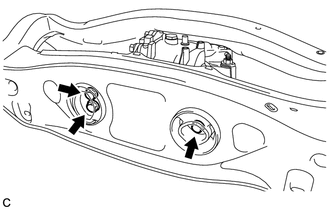 1 differential support facing in the direction shown in the illustration. Be sure to install each nut to position (A) shown in the illustration. (a) Install the differential support to the differential carrier assembly with 3 new bolts. 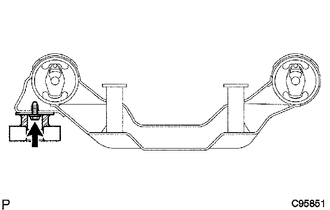 (a) Temporarily install the rear differential carrier assembly with differential support to the rear side of the rear suspension member assembly with the 3 rear mounting bolts. (b) Temporarily install the rear differential carrier assembly with differential support to the front side of the rear suspension member assembly with the 2 bolts and 2 nuts. 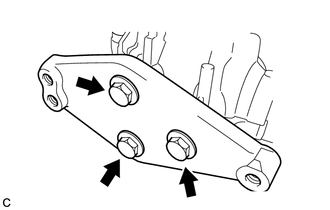 Do not tighten the bolts with the inner cylinder or rear differential mount cushion tilted. 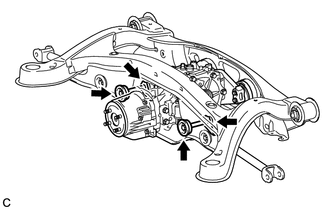 (a) Install the rear differential carrier assembly with differential support to the rear side of the rear suspension member assembly with the 3 rear mounting bolts. 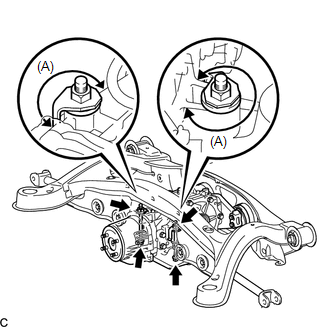 (b) Install the rear differential carrier assembly with differential support to the front side of the rear suspension member assembly with the 2 bolts and 2 nuts. (a) Install the rear No. 1 differential support to the rear differential carrier assembly with the 2 new bolts and 2 new nuts. Make sure that each nut is installed to position (A) shown in the illustration. 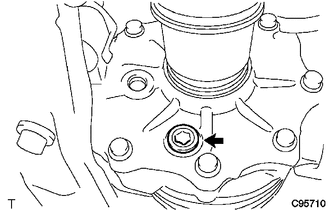 (1) Using a 10 mm hexagon wrench, install a new gasket and the rear differential drain plug. (2) Add differential oil (See page ). (1) Using a 10 mm hexagon wrench, remove the rear differential carrier cover plug and gasket.